Aurora Expeditions, Australia's leading expedition cruising company, continues to reinvent itself having today launched expeditions to all-new destinations including Latin America, Caribbean Coast, Iceland, Greenland and East Coast Canada. The global program marks a new chapter in Aurora Expeditions' proud history as it prepares to launch the Greg Mortimer in October 2019. The new state-of-the-art vessel has been purpose-built for adventure and will allow the expeditioners on board to explore new destinations and disembark the ship for small group excursions and cultural activities unique to each destination. Aurora Expeditions managing director Robert Halfpenny said the launch will be very well received by Aurora's customer base with many loyal travellers keen for Aurora to offer itineraries outside of the polar regions. "Aurora has been synonymous with Antarctica and the Arctic regions but with a new ship boasting innovative technology and comfort, we are now able to offer small ship travel to a range of new destinations," Mr Halfpenny said. 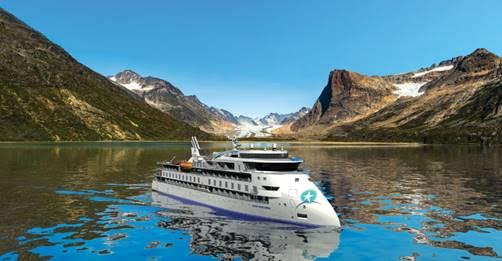 "The new itineraries will allow travellers to explore regions previously unvisited by cruise companies and this new product will see the Aurora spirit of small ship expedition cruising retainer with wildlife, nature and adventure at the heart of these experience. "By travelling to warmer climates, our journeys will now also feature unique cultural excursions and local activities," he continued. The program also includes a new 'Intuit Arctic and Beyond' voyage that will close out the Arctic season with a 21-day expedition through Iceland, Greenland and East Coast Canada. In addition to the new voyages, the program continues Aurora's mountaineering legacy by introducing new treks and the reintroduction of a Nepal trekking program – which was included with the blessing of Aurora Expeditions co-founder, Greg Mortimer who has a long and proud history of mountaineering. Launching with the global program are some exclusive early bird deals - offering a saving of up to 25% (maximum saving of approx: $5,600 AUD per person twin share) on voyages, as well as 10% off standalone trekking bookings for the Himalayas. Travellers can also receive 10% discount on treks in Iceland, Norway and Sweden, when booked in conjunction with an Arctic voyage. "As always, we'll be launching with the best value deals so I encourage agents to reach out to their clients and book now," said Mr Halfpenny.